Yes, my posts are far and few between. Busy, busy, busy. We had our first day of school, so I thought I should jump in with my yearly curriculum choices. 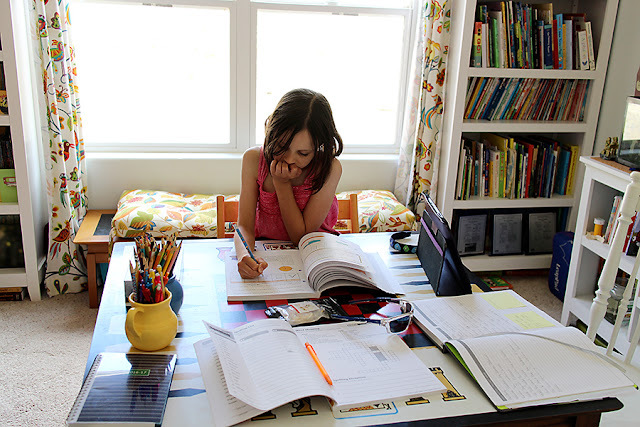 This is our fourth year of homeschooling. I'm no expert, but we're starting to get down what we like to do. The boy is in sixth grade this year and the girl is in fourth grade. Math: The boy is doing Teaching Textbooks 7. We've gone back to Teaching Textbooks and I'm hoping he still likes it in a few weeks! The girl can't wait to get to it. She'll be doing Horizons 4 and 5 this year. She's over halfway through 4, so she'll start 5 when she gets there. English: We're still sticking with Bob Jones because we all like it. Both kids are doing Bob Jones English 6 this year. I like how it alternates between grammar and writing. 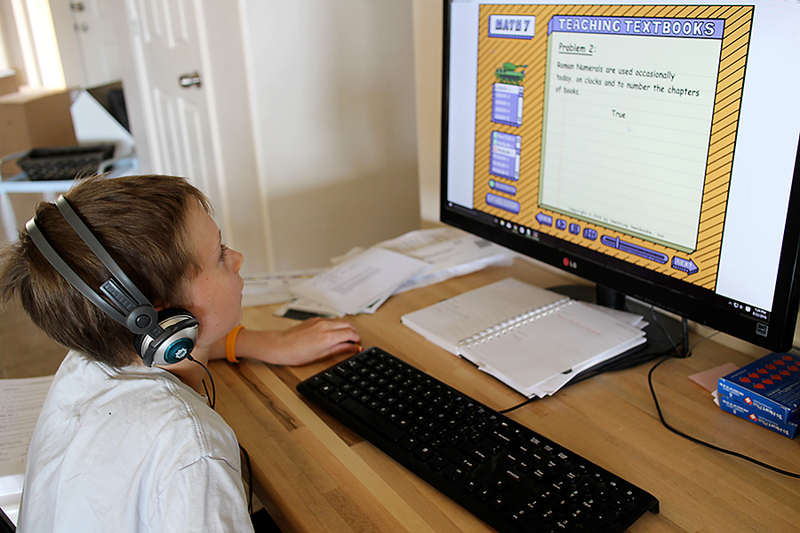 The kids like the colorful workbooks with a short guided practice section and a short independent work section. Vocabulary: Vocabulary Cartoon of the Day. So fun and the kids love them! Spelling: We're trying workbooks this year. We'll be using Evan-Moor Building Spelling Skills. The boy will be using Grade 6 and the girl will be using Grade 5. 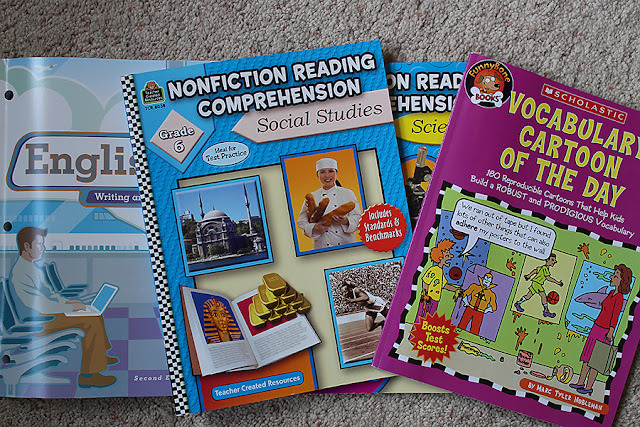 Reading Comprehension: The kids will do two short readings a week. One from science and one from social studies. Both will do the Grade 6 books. Social Studies/History: We're continuing with Mystery of History and doing Volume 2 this year. I will be adding on some additional weeks of studies involving Castles, Catherdals, and more Middle Age stuff. 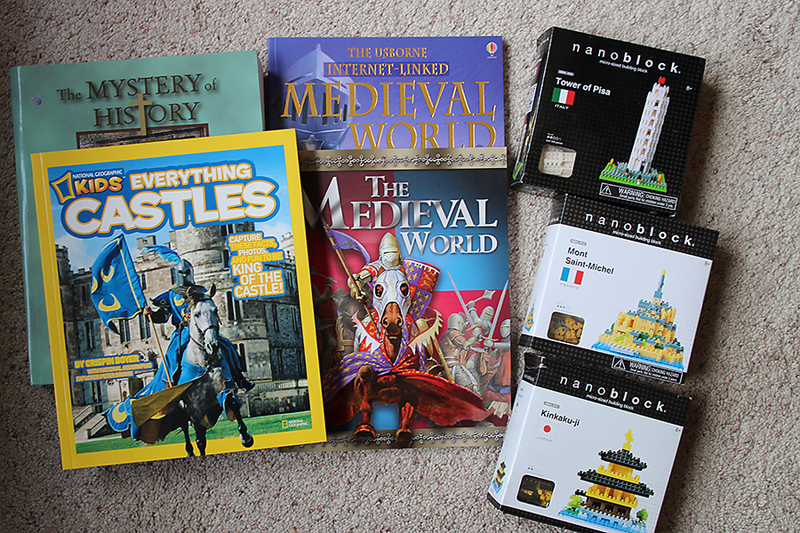 Plus some Nanoblocks, cause we love those things. We'll be doing the Tower of Pisa, Mont Saint-Michel, and Kinkaku-Ji. We'll do some others only if I find a good deal on them. Extracurricular: We're adding in Computer Coding and Spanish. 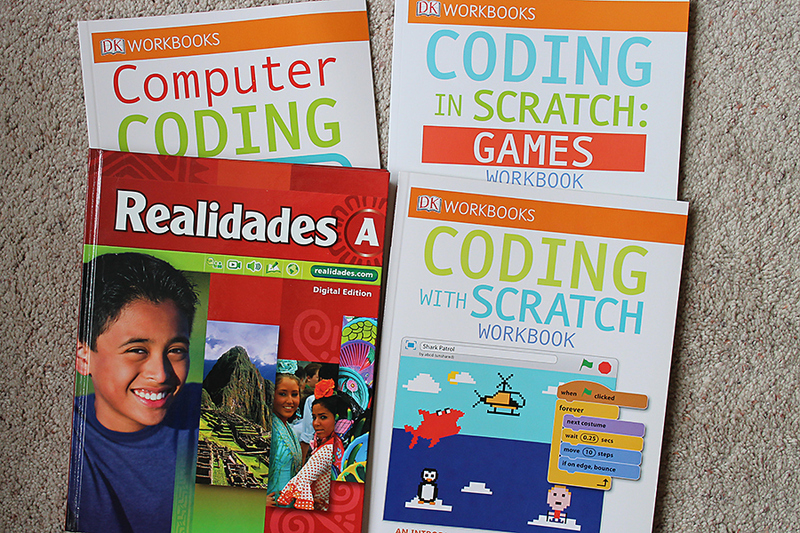 I got some DK Workbooks to get us started with Computer Coding. We're starting with Scratch at scratch.mit.edu. 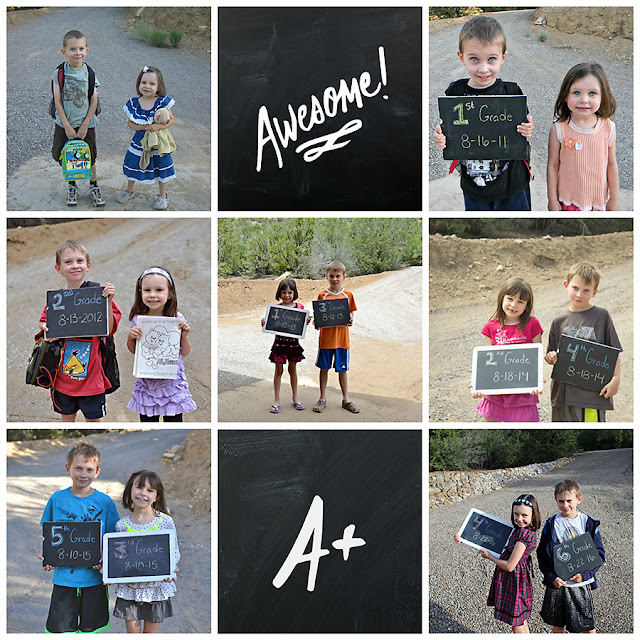 The kids tried it on the first day and loved it! It was a hit. It's kind of like block programming with Mindstorms, so the boy already understands it. The girl had fun playing around with it. We're using Realidades A for Spanish lessons. Science: This year we're studying Earth Science. I love science! I was more of a life science and chemistry science teacher, but I took plenty of earth science classes when I was getting my undergrad and masters. I'm excited to do this with the kids and review what I haven't done in awhile. I'm again piecing things together for the kids. 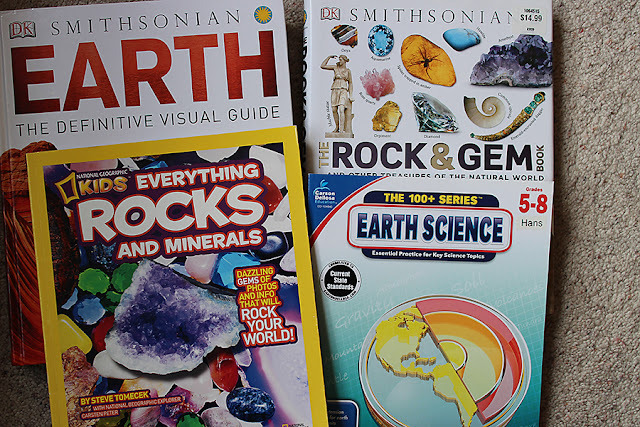 We're using the books pictured above with the 100+ Earth Science series for some worksheets. I'm using selected lessons/readings from www.ck12.org Earth Science as our "textbook." They do have a free middle school Earth Science textbook that you can download on Amazon, but I'm using the readings on their website. We'll have lots of hands-on lessons and field trips this year. Reading: Oh my! I love books. I went crazy here! Here's a selection of read-alouds and personal reading that the kids will be doing. (I read the read-alouds to them, they read the personal ones on their own.) Many of the read-alouds are historical fiction related to the time periods that we are studying. Planning: Let's just say I'm a planner. I like to have the year planned out. We may not follow it exactly, but I'm more likely to have the kids do stuff if I have it written down. The kids are using planners this year to keep track of assignments. 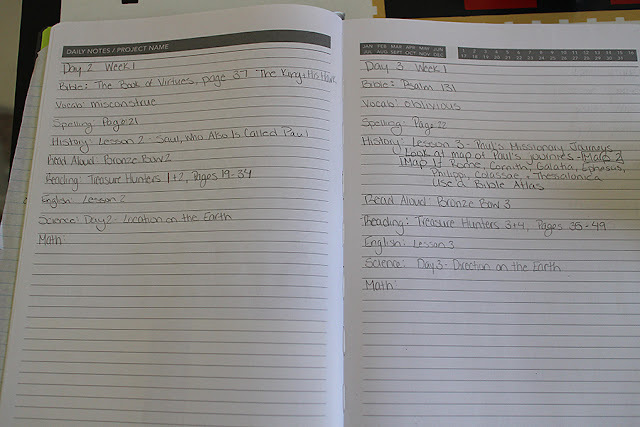 The one pictured below is my master teacher planner. 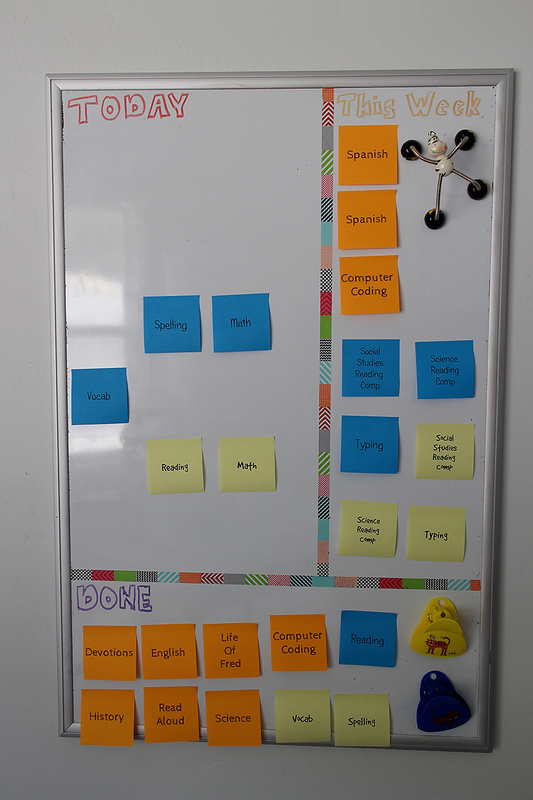 Since we have more work this year, I'm trying a Lean Homeschooling Board. This helps me to keep track of what needs to be done for the day/week and shows me what the kids have completed. That way I don't have to ask them what still needs to be done. We start in the morning by completing the subjects that we do together (orange post-its). After lunch the kids continue with their separate subjects (blue for the boy and yellow for the girl). Of course, we do a yearly picture. Here's a collage of all the ones that have been taken since the boy started kindergarten. Here's hoping it's a good year, it's off to a great start!